Ian Lenagan hailed the “radical change” which will lead to the start of a new era for Super League. He flanked the competition's new CEO Robert Elstone as he was unveiled at a media conference in Warrington this afternoon. Speaking on behalf of Super League directors he outlined his vision for competition. In former Everton chief executive Elstone's first press conference as Super League's new chief executive, the issue of the game's structure was addressed and a return to promotion and relegation looks the most likely route. Elstone spoke of his passion for rugby league after being formally introduced as Super League's new chief executive. 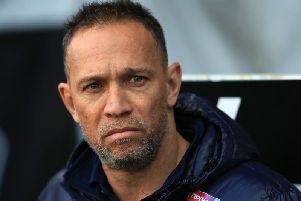 The 54-year-old took his new job eight days ago and held his first press conference at Warrington's Halliwell Jones Stadium. "This is the only job that would have taken me away from Everton," he said. "I've loved rugby league from the first day I can remember. "I care passionately about this sport." Elstone was appointed by the Super League clubs following an extra general meeting last October when they voted Rugby Football League chief executive Nigel Wood off the board. Wigan owner Ian Lenagan told the press conference the move did not amount to a breakaway. "We are not in any way breaking away from the RFL," Lenagan said. "The RFL is the governing body for rugby league. "What we have done is taken responsibility for commercial activity to give the top tier the focus it should have. "We believe it is very important that the sole focus is on Super League." Lenagan, who revealed that Leeds are the sole dissenting voice, said the Super League board remains committed to promotion and relegation but St Helens chairman Eammon McManus said there are plans to change the structure of the domestic game from 2019. "We don't believe the Super 8s work," said McManus. "We do not believe it is producing the right commercial returns. "We have to conclude a new structure to put in place for next year."